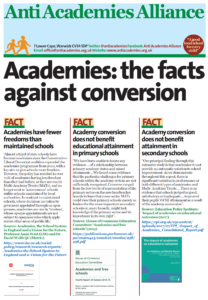 In 2010, Michael Gove promised an educational “revolution” as he rolled out plans to allow all schools to convert to academy status. This would, apparently, increase educational achievement – and in particular enhance the life chances of the most vulnerable. As a mum and a teacher, I felt duty bound to campaign against the policy. With a group of parents we started the Save Our Schools Campaign in Louth. 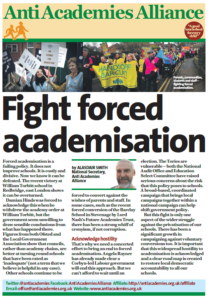 Our fears were that we were on the cusp of the privatisation of education, and that we would see systems in place to assure accountability, protect the vulnerable, and ensure excellence lost. We did not see ourselves as people who Gove termed “the enemies of promise.” We saw ourselves as the protectors of it. So where are we four years later? I would love to say that I was wrong! I would love to be in a situation where standards were on the up. As painful as it would be to have been wrong, I have four school aged children. Why wouldn’t I want the system they were being educated in to succeed? The Lincolnshire evidence only highlights the failure of Gove’s revolution. With the vast majority of secondary schools now converted, we have seen 3 successive years where results at KS 4 have slipped. The fall is not dramatic – we are still above national targets – but it is still a fall whichever way you dress it up. Most worryingly, the gap between the achievements of children on Free School Meals and their peers at KS 4 has actually widened since Gove’s revolution commenced. This contrasts starkly in comparison to where Lincolnshire schools are flourishing. At primary level, where we still have the majority of schools within council control, we are over achieving on every target. Whether it is Foundation Stage, KS 2 SATS results or narrowing the gap between children on Free School Meals and their peers we have outstanding results. The reason for that success is that LCC has, within their primary schools, established a collaborative model of working. Schools support and challenge each other. They share staff, resources, training and ideas. This collaborative model, when teamed with great leadership and governance, has international and national recognition as the best way to drive up standards. 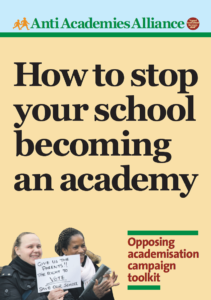 If Gove had been interested in reality, it is this model – not a competitive one – that he would have used. The education jigsaw in Lincolnshire is being put back together by the local authority who Gove snatched it from. I am pleased to be part of a positive debate within the County Council on improving secondary standards. Moves are being put in place to re-establish a collaborative approach to secondary education, with schools and academies being encouraged to work together to replicate the success of the primary sector. A positive future for education locally and nationally must include ensuring that Local Authorities are given back the powers they need to run education in the best interests of all of our children.